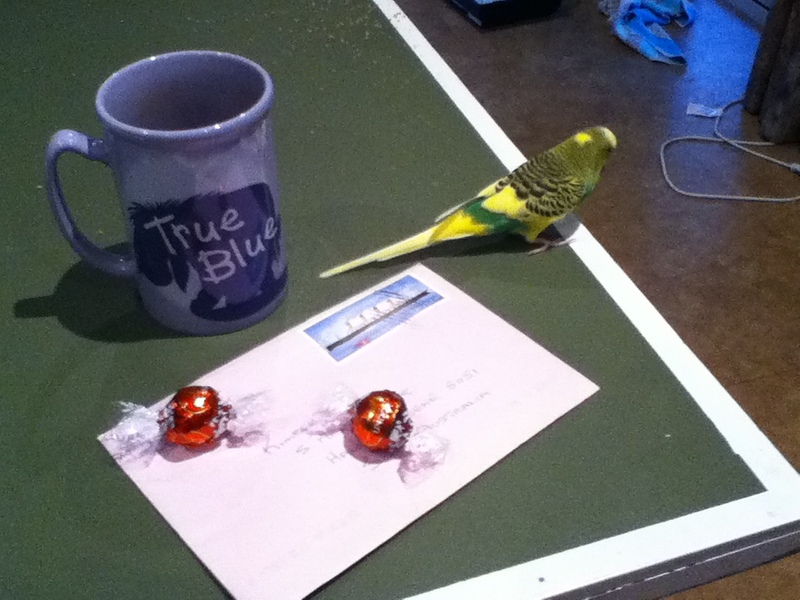 Even Skittle loves real mail. Real, true mail. Remember that? It arrives in the box at the end of your driveway. It’s made of paper. It has a pretty stamp on it. It quickens the pulse. Somebody loves you! Don’t get me wrong, e-mail is a wonderful thing that shows love too. I likely wouldn’t have survived the year without the immediacy and constancy of it. There have only been a handful of days I haven’t woken to one in my inbox from a close friend or family member that knew I needed those little nuggets to keep my spirits up. And yet, tonight, when I opened my mailbox to see an envelope like I did, my heart nearly stopped! It wasn’t long and skinny with a plastic window through which black type shouted “PAY ME, PAY ME!” It was nearly square and PURPLE. When an envelope is coloured you KNOW it’s special. My lofty aspirations to finish up the last tid-bits of my report cards flew right out of my mind. I skipped back inside to start the kettle for tea and gather some chocolatey treats. Even if it’s one-sentence scribbled on a scrap of paper it deserves the ritual of a sit down read. SOMEone thought me special enough to pick up a pen, sit at a flat surface, find an envelope – and a stamp – and then a mailbox. That’s a lot of effort these days. Thanks, Momsie, for sending me birthday love tonight – well, ten or so days ago, actually! What’s the last special mail you received? Maybe more importantly, when is that last time you SENT real, stamped, paper mail? so true! I do the same ritual, I wonder how many people rip it open right at the mailbox?! No word of a lie…. watch your mail next week. I was thinking of you this MORNING!! WHEEEEE – Can’t WAIT to see you in a MONTH! We MUST make time for a few pots of tea. When my kids get actual real physical mail, I lay it on the kitchen table for them as if it were a rare gift, which as you mentioned…it is.